VIDEO- A Word From Matt Butler About Everyone Orchestra’s NE Shows w/ Steve Kimock, John Morgan Kimock, Todd Stoops & More This November! 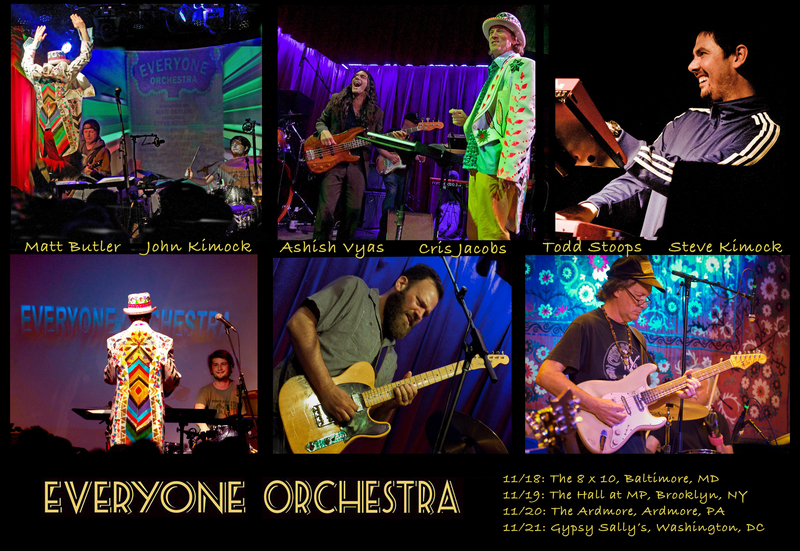 VIDEO- A Word From Matt Butler About Everyone Orchestra’s NE Shows w/ Steve Kimock, John Morgan Kimock, Todd Stoops & More! 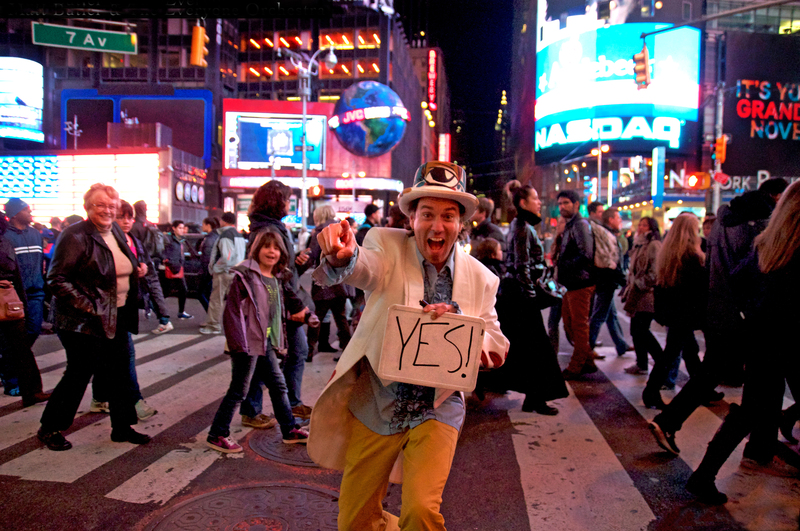 Everyone Orchestra is excited about their upcoming run of shows in the NorthEast States in mid-November in Baltimore, Brooklyn, Ardmore (Near Philly), and Washington, DC! Conducted by Matt Butler, these performances will feature Steve Kimock (guitar), John Morgan Kimock (drums), Todd Stoops (Raq – keys, vocals), Cris Jacobs (The Bridge – guitar, vocals), Ashish Vyas (Thievery Corporation – bass). Find out more in this great video update from Matt! * Conducted by Matt Butler featuring Steve Kimock (guitar), John Morgan Kimock (Mike Gordon – drums), Todd Stoops (Raq – keys, vocals), Cris Jacobs (The Bridge – guitar, vocals), Ashish Vyas (Thievery Corporation – bass). In 2005, I began working for a music promotions organization called Home Grown Music Network, based out of Mebane, N.C. Founded by radio DJ and music fanatic Lee Crumpton in 1995, it’s a multi-platform company that offers a pool of volunteers, nationwide, willing to promote touring bands in exchange for free music and concert tickets. Bands are chosen as network members through a rigorous selection process that aims to pinpoint the best independent groups in and surrounding America’s festival scene — bands that don’t fit neatly into simplified genres like “roots rock,” “jam,” or rock‘n’roll’s other current labels. Once chosen, HGMN (www.homegrownmusic.net) provides several career resources for these groups trudging through the mire of a frenetic — if not negligent — music industry without corporate backing. In addition to the cells of volunteers and fans around the country, bands also get to sell their CDs and merchandise through the well-trafficked website, get added to playlists at affiliate radio stations, and be put in the faces of thousands who might not have heard them otherwise. HGMN even started its own record label, Harmonized, in 2002. Needless to say, the folks behind the organization — Crumpton and press/volunteer coordinator Chris Robie — are indefatigable. When I signed on as a volunteer and later a journalist, I received at regular intervals boxes upon boxes of music catalogs, posters, stickers and the best part — free CDs. I devoured these LPs, EPs, live discs and samplers. In addition to starting my music journalism career, HGMN turned my home into the lush flowering pot of musical mayhem that it remains. And, as many musicians and promoters know, the relationships between fans and bands of true substance often prove unbreakable. During this time I discovered Sim Redmond Band from Ithaca, N.Y., whose worldbeat track “All is Not Lost” entered the hallowed ground of my Top 10. I discovered The Bridge, a sumptuous and energetic rock sextet from Baltimore, who, in fact, I’m making a three-hour road trip to see tonight, at Higher Ground in Burlington. I brought my love of them with me when I moved from Chicago to Vermont. That’s the sort of dedication these bands inspire. Donna the Buffalo was one of these groups. When seeing it in the catalogue, I thought the name was rather strange, but intriguing. It struck me as possibly some Native American band full of environmental activists, people whose concerts included ritual and howls and 10-minute drum jams. The howls are there, I came to find out, but there are many more whines of the accordion and wisps of Cajun/zydeco tomfoolery involved than riffs on global warming or trance-inducing drum circles. Donna the Buffalo, a 21-year-old cult favorite quintet from Trumansburg, N.Y., is energetic, inventive and soulful, and imagine the thrust down memory lane I experienced when seeing they’d be playing Tupelo Music Hall in White River Junction on Saturday. They’ve kept trucking, against the odds for an independent band, and are more popular and prolific than ever. Nevins — who contributes accordion, scrubboard, fiddle, guitar and vocals — founded Donna the Buffalo with guitarist/vocalist Jeb Puryear in Ithaca, N.Y., in 1990. Nevins had been a longtime fiddle player, and she and Puryear began writing songs together with no definitive plan in place, just exercising creativity in that college town’s rich musical milieu. After returning from a trip to southwest Louisiana for Mardi Gras, she was so deeply inspired by the Cajun and Creole music she’d encountered that she added a zydeco flair to her playing, soon recruiting more members and solidifying the sound of the fledgling band. Nevins will release a solo album entitled “Wood and Stone” in April on Sugar Hill Records. Donna the Buffalo’s show on Saturday at Tupelo Music Hall, a BYOB venue, begins at 8 p.m.
Two other concerts occur in southern Vermont this weekend in that road warrior spirit of purity, that essence of which Home Grown Music Network lauds and nurtures. The first, incidentally, is also a Home Grown band and a zydeco band, Buckwheat Zydeco, from Lafayette, La. Buckwheat Zydeco is the stage name of accordion player Stanley Dural Jr., born in 1947. He’s one of the only traditional zydeco acts to achieve mainstream, pop culture success; the band is a household name among southern music fans. He brings his group, formerly billed as “Buckwheat Zydeco and Ils Son Partis Band” to the Bellows Falls Opera House at 8 p.m. tonight. And tomorrow, San Antonio, Texas, alternative-country songbird Rosie Flores brings her distinctive mixture of Tex-Mex, rockabilly, honky tonk and jazz/swing to Boccelli’s On the Canal in Bellows Falls at 7:30 p.m.
It’s a weekend of from-the-heart, multicultural creative whimsy happening around our stomping grounds. Throw your best “devil may care” glance to the snow and add your yelp. Clara Rose Thornton is a freelance cultural critic and arts journalist originally hailing from Chicago who now lives in an artists’ colony in Bellows Falls. She can be reached at clara@inkblotcomplex.com, or through her website, clararosethornton.com. Follow her at twitter.com/ClaraRose.